“Are those termite holes?” Gary looked concerned, given that the massive beam in question was clearly instrumental in supporting the floor above us. “Yeah,” I replied, reaching up to break off a jagged piece of the hole-peppered wood to demonstrate just how brittle that section of beam was. “Whoa. Can’t be good,” Gary said, unnerved. I relented in my cruel little game and explained, “When my husband Dave and I bought this house, the building inspector told us he could drive a key into this beam and still find more solid wood at its core than in a house newly-built.” My companion nodded, relieved, and brushed aside a swag of cobweb as he turned to inspect the hot water heater. For that was our purpose in the basement. 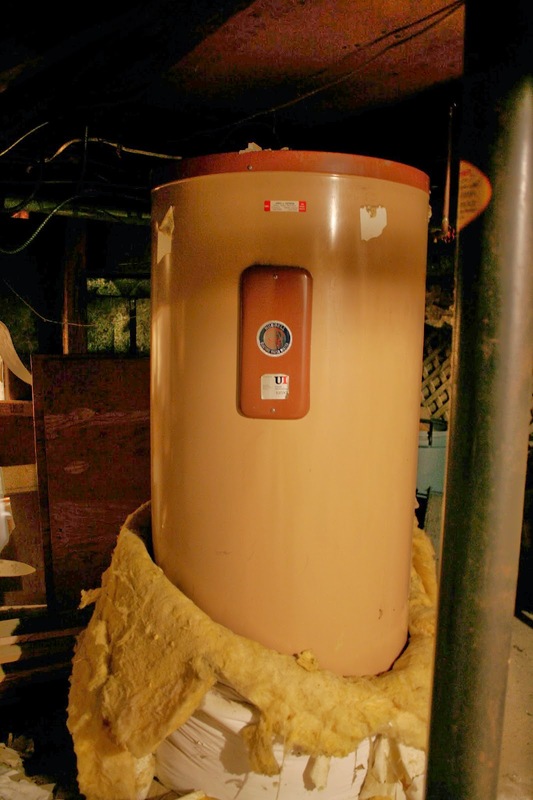 The furnace and hot water heater – one, a cast-iron behemoth hulking in the deep shadows, the other a massive beige cylinder – are old. Not as ancient as our 1782 house, but they’ve done their time. They have squatted below for twenty-four years, thrumming audibly to life to keep us warm as long as we've been here. The furnace is checked and cleaned annually and in recent years I’ve been told, “She’s good for maybe three more years. ’Course, could go in a year. Hard to say.” Love that uncertainty. So the furnace is on hold, but I called the utility company to request a visit regarding the hot water heater. I was told it was not their policy to come out unless there was a leak. She said ours was an 80-gallon unit installed in 2003. “That’s not what our records indicate.” The woman was pleasant, but firm. And wrong. I’m not sure why I thought to mention it to her, but our cats had shredded the heater’s insulation wrapper and the tall beige cylinder stood nearly naked, strips of pink fiberglass batting hanging from her sides like rags on a beggar. “Oh! Well! That’s a problem, isn’t it? We’ll send someone out to take a look!” Chipper, agreeable, helpful. Within two days, I got a call, and Gary was at the door. I felt foolishly smug that I’d been right in forcing this visit, but also, a little sad. Seriously? Over a metal cylinder? Yes. I am prone to personification and somehow, these two warm-hearted monoliths in our basement seemed like old soldiers, guardians who had served us faithfully all these years. And they don’t make ‘em like they used to. Was it a mistake to cast them aside even as they hummed away, doing their jobs as they always had? Not according to Gary. Evaluation complete, we climbed the basement stairs and stopped in the kitchen while Gary leaned on the counter to fill out the paperwork. He passed on the coffee I offered, but we chatted a bit about the forecast for another snowstorm, some property he owns in Vermont, and my mother’s 1938 Roper stove. He shook his head at the date. “She getting’ rid of it?” he asked. “There it is again,” he said. “Don’t make ‘em like they used to.” He instructed me to call his office and make an appointment for the replacement, and we shook hands as he took his leave. For some reason, I had to restrain an impulse to give him a hug. 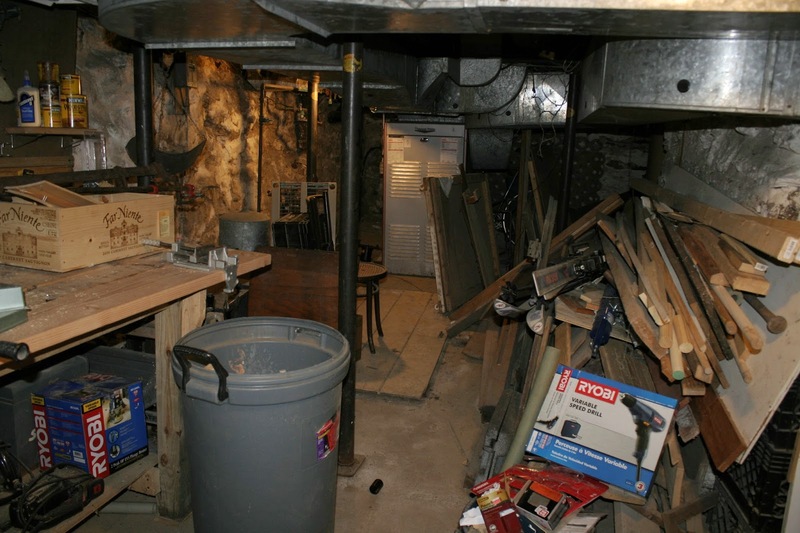 In the days preceding removal, Dave cleared away planks of wood, paint cans, and cases of bottled water to create a path through the basement to the bulkhead. In a flurry of disrespect for our resident spiders, I swept free cobwebs festooning the ceiling beams. And on January 28, I stood in the basement, part of a semi-circular assembly around our heater, with five burly men, each almost interchangeable with the others in dark blue uniforms, woolen caps pulled low over brows, and scarves muffling chins. “Once upon a time,” I filled him in. Was I imagining it, or was there an air of reverence as the men considered the venerable cylinder before them? One, obviously a soul sensitive to my mixed feelings, pried off the metal plate embossed with the unit’s vital statistics – brand, model, and serial numbers – and gave it to me before the men set to work. I was intrigued that the new unit was hauled in first and tipped upright next to its elderly counterpart, an odd sequence as it reduced maneuver room even more. In truth, maybe I was nettled on behalf of the 1966 model at having this shiny white upstart thrust so suddenly into its space. With canvas straps guiding and much grunting and bracing of shoulders, the old heater was lowered onto a red hand-truck. 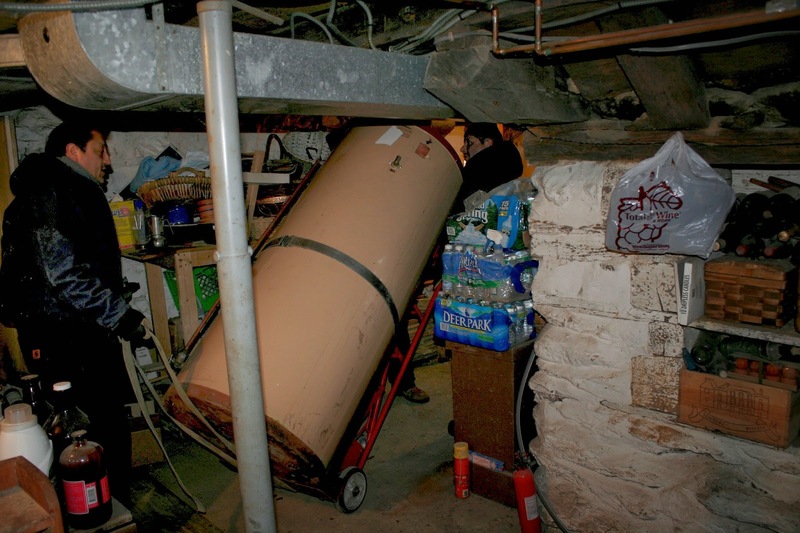 Slowly, the men navigated the cylinder around the base of the chimney and lolly columns, under the stairs, past the washer-drier, and through a 29” door that barely permitted passage of the 29” unit. Down a step the procession continued, into Dave’s music room, where guitars and empty glass wine casks lined the wall like spectators on a boulevard witnessing this final passage. P.S. Within nine days, the new unit failed twice. Yes. Twice. Somewhere out there the old 1966 model is smirking. They don’t make ‘em like they used to.